Leon and the Revival emerged in 2015 when members began to collaborate on a new project that showcased their shared love of classic soul and R&B music from the 1960s and 70s. Influenced by Otis Redding, Van Morrison, Darondo, Solomon Burke, Ann Peebles, Rateliff and the boys, The Band, Sam Cooke, and James Brown. The Revival fuse multiple musical styles into a high-energy, deeply satisfying live musical experience. The group has proudly performed at Five Points Jazz Festival, The Underground Music Showcase, Docuwest Film and Music Festival, The Bluebird Theater, Globe Hall, Larimer Lounge, Bar Fly, Goosetown Tavern, and a wide variety of other Denver venues and shows in Washington and New Mexico. Leon and the Revival has had the pleasure to have played with great national acts like Rebirth Brass Band, The Family Crest, Davina and the Vagabonds, and a growing list of other great bands. Although Leon and The Revival’s sound is firmly rooted in traditional soul music, they infuse their songs with modern touches: driving guitar and keys and pounding rhythm section. Leon and the Revival is Paul Leon Ramsey, vocals; Andy Schneider, keyboards and vocals; Mark Nelson, bass; Eric Marshall, drums; Eric Rudnick, guitars; and a killer horns section: Breana Knight, Trombone; Michael Windham, Saxophone; and Randy Runyan, trumpet. 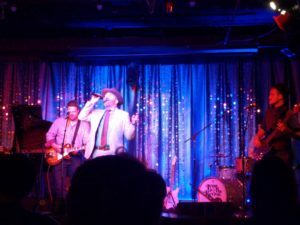 Frontman Paul Leon Ramsey describes his inspiration for the Revival’s live shows: “When I was a kid, my dad’s cousin told me that when my dad was a teenager, he used to sneak out of the house on Friday nights to sing at the juke joint on the outskirts of town. As he told me the story, I watched my father blush (for the first and only time).